Total Retail published their annual Top 100 Omnichannel Retailers report for 2018 in conjunction with Radial. We decided to do a mini-report of our own to see how they are using their website to acquire emails. Total Retail released the second annual ranking of 100 publicly traded retailers based on their omnichannel capabilities and programs offered, as well as the execution of said programs. The report scores 100 retailers on their ability to sell online, pick up in store, search for in-store products, and many more criteria. What they didn’t analyze, however, is the website acquisition strategies of these retailers. So we took it upon ourselves to do some analysis of our own, and share our thoughts about what we found. Our analysis was conducted by going to the website of each retailer, waiting for 10 seconds without scrolling or clicking anywhere, and then identifying the main acquisition tactic employed on the homepage of that website. We recorded six core pieces of data: method, placement, offer, CTA, timing, and information collected. While there’s more data that could have been collected, we only collected the most important data for the sake of time and brevity. Method: How are they acquiring emails? As outlined in our post how to build your email list, we defined methods in certain ways to help distinguish between different forms of acquisition used. Lightbox: A popup that appears on top of the page’s content while the rest of the website is dimmed out. Announcement Bar: A thin floating bar in the header that appears with the website. Pop-out: A popup that appears out of a side of the browser while still allowing the visitor to continue browsing. Embedded Form: A form that displays as a part of the web page to collect information. Text: Short for text-to-join, a service that allows someone to text a number to opt-in for emails or other notifications. Link: Hyperlinked text that takes someone to another web page. None: No opportunity for opt-in on the homepage. The two most popular methods were a lightbox popup and an embedded form on the website. While this wasn’t surprising, what was surprising was how many retailers only had a link to a landing page where people could sign up. 11 out the 100 only had a link to another page to capture someone’s information. While this report is not meant to dictate what works or performs best for a retailer, it’s certainly peculiar that these 11 retailers aren’t more aggressive with their acquisition tactics. 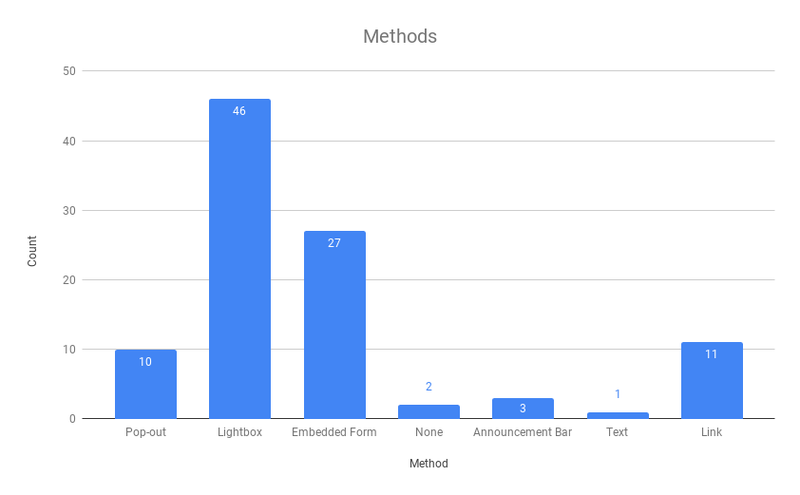 It’s also interesting to see the variety of methods, considering that 54 of the 100 retailers did not use a lightbox popup. Placement: Where are they acquiring the emails? We defined the placement as location on the screen or web page that the method appears. 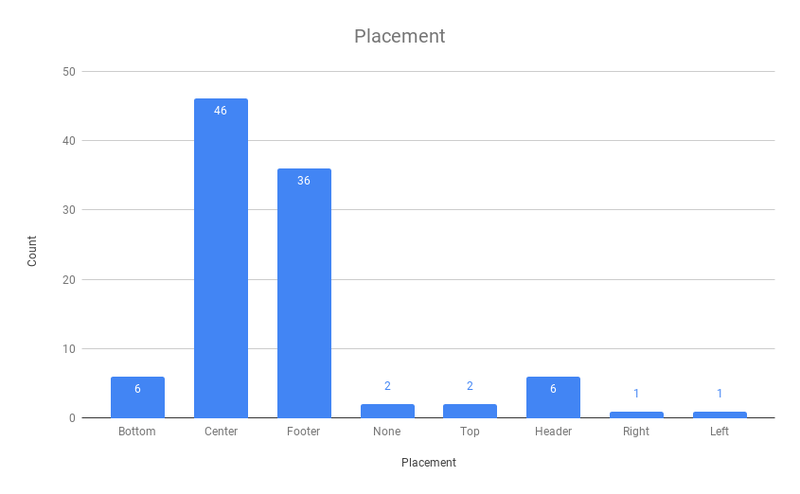 This chart mirrors the placements chart in most ways, with center and footer being the two most popular options in correlation with lightbox and embedded forms. There were a considerable amount, however, in nontraditional placements such as the top, bottom, header, right, and left with a total of 16. Offer: What are they using to acquire emails? We also studied the offers that retailers made to convince users to opt-in on their website. The most popular offer was a simple invitation to join the newsletter. Retailers used language like “Join the club,” “Get exclusive deals,” “Email-only offers,” and “Sign up for our newsletter.” This was a bit surprising considering that it’s not a very enticing offer. Understably, retailers are hesitant to offer too many discounts because they don’t want to train users to only buy when they have a discount, and discounts hurt the top line anyways. But there’s definitely room for improvement to make a more attractive offer without offering a discount. 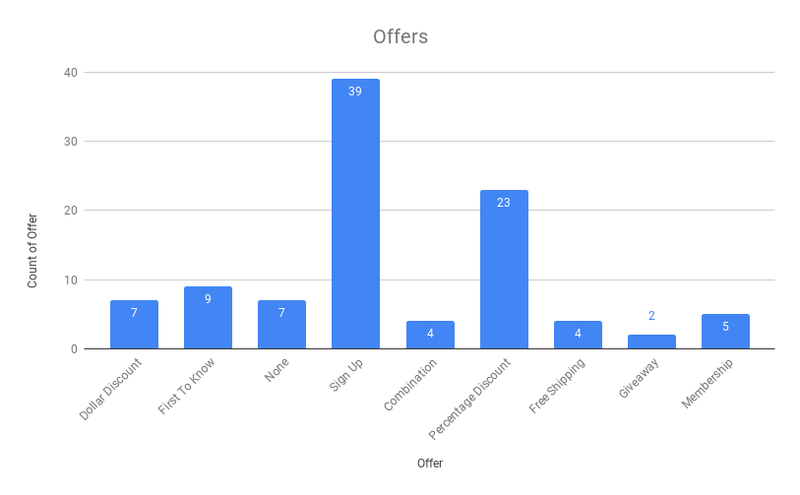 A total of 34 used a discount (or a combination of offers including a discount) to incentivize users to opt-in by email. Only 4 used free shipping in their offer, 2 used a giveaway, and 5 framed their offer in the form of a membership. But maybe most interestingly, 5 (2 retailers had no acquisition method) retailers had no offer at all, simply a box to enter in an email address. CTA Button: What’s the main call to action button they use? Looking at the trends in CTA buttons used, it’s clear that there are some favorites, including sign up, submit, and join. None accounted for all forms that had an icon in place of the text on the button. Again, while we are not CRO experts and definitely not here to critique their decisions, it’s interesting that only 5 use “subscribe” for their CTA button. 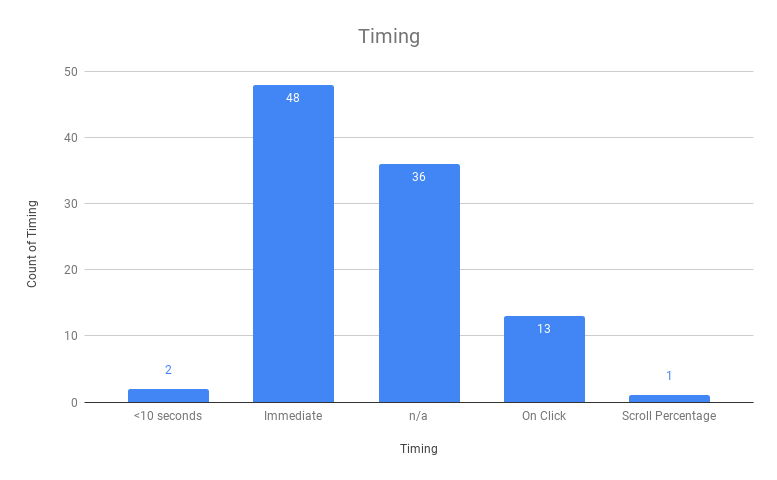 Timing: When is an offer displayed to acquire emails? This is only relevant for lighboxes, announcement bars, and pop-outs, since embedded forms, text, and links are always on a page, hence the n/a option. What was surprising in this category was the sheer number of popups that displayed immediately. Only 2 popups appeared on a time-delay under 10 seconds, and 0 popups appeared on a time-delay over 10 seconds. Sumo did a report on over a billion popups and claim that the highest-converting popups don’t appear immediately. According to the report, of the top 10% of popups, only 8% had popups appear in the 0-4 second mark — and the majority of those 8% were on pages where the popup was expected to appear quickly, like a download page for example. Based on my own personal experience, I wouldn’t recommend popups to display immediately, but again, I have no insight into how they’re performing for each of those retailers. 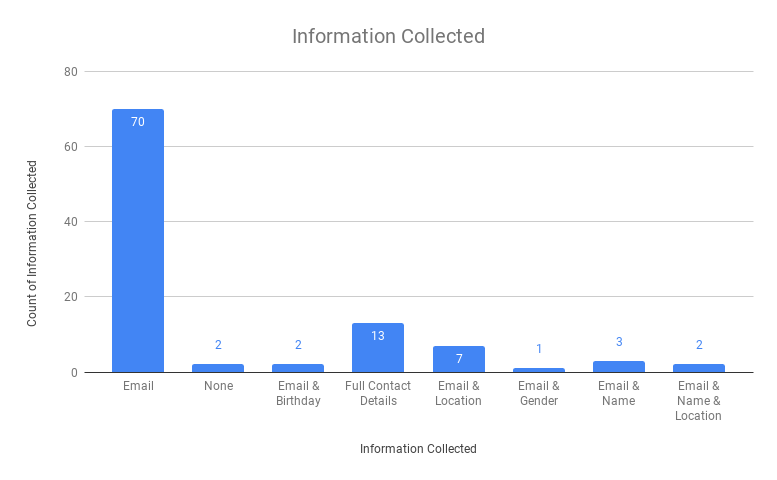 Information Collected: What information are they collecting when acquiring emails? The overwhelming majority purely collected an email address. However, 28 of the 100 collected more than just an email address. There’s clearly a difference in strategy between the 70 who only collect email address and the 28 who collected more than an email address. What that strategy is? It’s not completely clear. What’s interesting is that only 7 “omnichannel” retailers are collecting information about location when acquiring the email address. This tells me that the other 93 are collecting information about customers’ location in another way, probably without the customer knowing. DSW, also the #1 omnichannel retailer in Total Retail’s report, does an exceptional job with their pop-out at the bottom of the screen. It’s unobtrusive, relevant, and an enticing offer. It’s also interesting to note their “*OFFER SENT IN 3-4 DAYS.” They’re the only ones I saw that made an offer that couldn’t be redeemed immediately. My theory is that this improves the quality of the lead by attracting people who are looking for more than just a quick hack to get a discount. 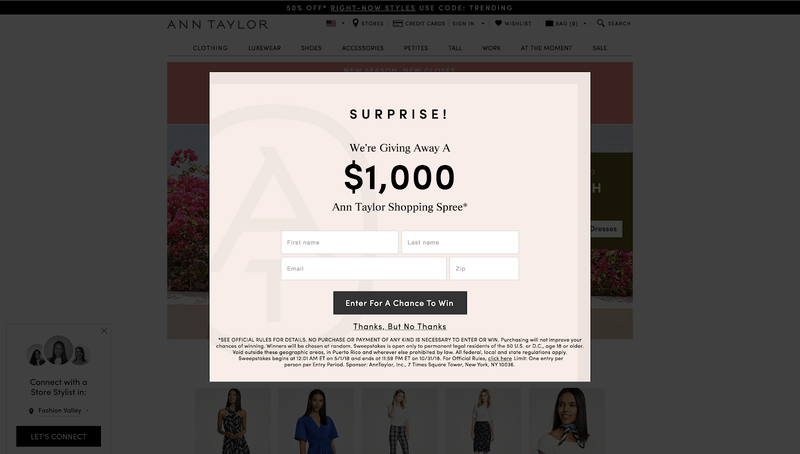 Ann Taylor was the only retailers to use a giveaway in their website email acquisition strategy. It’s a lightbox popup that displays immediately, but the immediate display is much more relevant than a discount code or offer to sign up for a newsletter. The copy is concise and straight to the point. The exit text, “Thanks, But No Thanks” is a refreshingly kind decline. PacSun also opted for a less obtrusive pop-out that immediately displayed in the top right corner of the screen. It’s simple, highlights the 10% off discount, and also collects additional information about what kind of apparel the user is shopping for. When the offer is revealed, it’s a 15% off discount on their first online purchase and they have to enter their email to activate it. This is exceptionally clever because the user has already expressed interest and gone through the work to click on the button to reveal the offer, it feels more exclusive because they didn’t offer 15% right away, and the one form field now seems like an easy ask. Finally, Destination Maternity. Again, what differentiates this popup displaying immediately from other popups that display immediately is that it’s relevant. This one is particularly relevant to a first-time visitor to the website. The popup actually assists the user in a helpful way to identify what they might be looking for. Users can self-identify or simply continue to the regular site. In reward for getting to know the user a bit more, when a user chooses one of the options, a relevant offer is made in exchange for more information. The offer and information collected is dynamic to which option was chosen. If you’d like to see the screenshots of the 100 retailers, you can follow this link to see a google drive folder. After analyzing all 100 retailers, the results were both surprising and predictable. 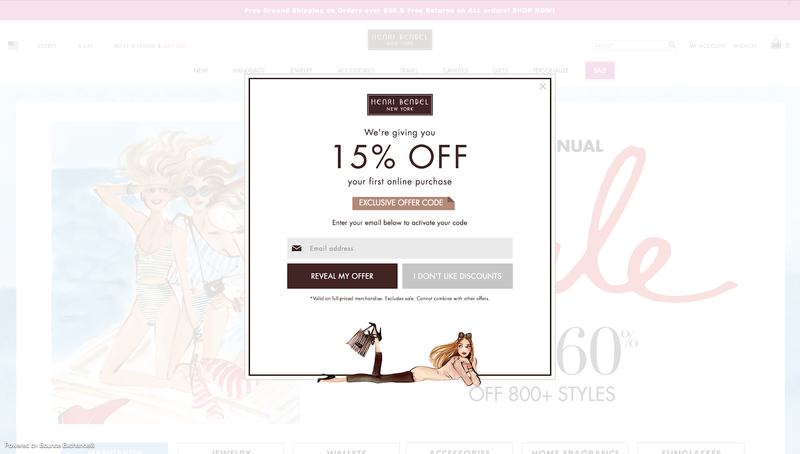 It was surprising that 54 of the 100 retailers did not use a lightbox popup, that the vast majority displayed their popups immediately, and that 28 out of the 100 retailers were collecting information beyond just the email address. Will you do me a favor? Whether you loved or hated this post, could you share it and tweet at me (@coreyhainesco) your thoughts? I’d love to hear what you thought about this kind of post. You can also email me anytime at [email protected] If you want to learn more about Cordial, I invite you to join us for a no-strings-attached live demo this Thursday.